Showcase your work with this high-quality mockups of Can. These PSD files are using the Smart-Object, so you can replace the mock-up content easily and quickly. Features: 2 Photorealistic Mock-Ups, 1 Psd Files. Easy for place your design. Changing perspectives and layer masking are not needed simply place your design. Separated background. High Resolution: 4000×4000px. 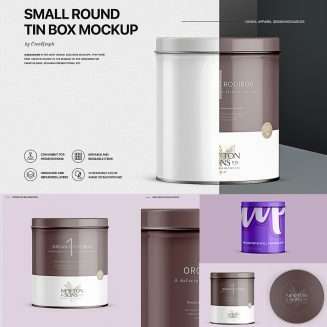 Tags: 3d mockup, box mockup, can, metal tin, package design, packaging mockup, round, tea, tin, tin box.